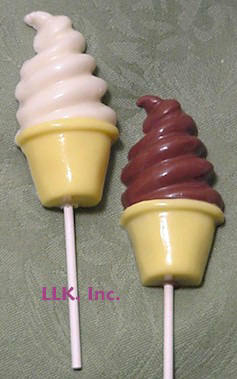 Soft Serve Ice Cream Lollipop - Starting at $2.95 ea. Available in two color as shown or 1 color, 2 ounces, poly bag, tied with ribbon. 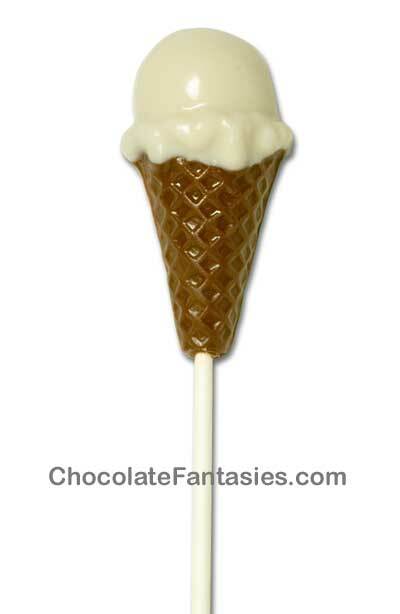 Ice Cream Cone Lollipop - Starting at $2.75 ea. Available in two color as shown or one color. 1 ounce, poly bag, tied with ribbon.. 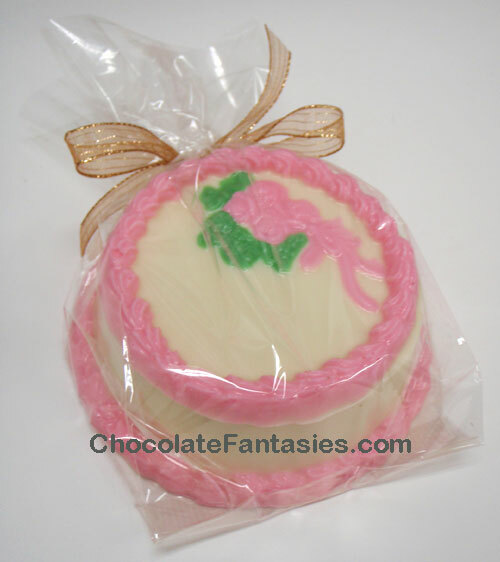 This 4" chocolate cake is filled with your choice of fun chocolates. What a surprise when the lid is opened to reveal what's inside! Poly bag with ribbon. Fillings can be custom, if there is something not listed, send us an email. 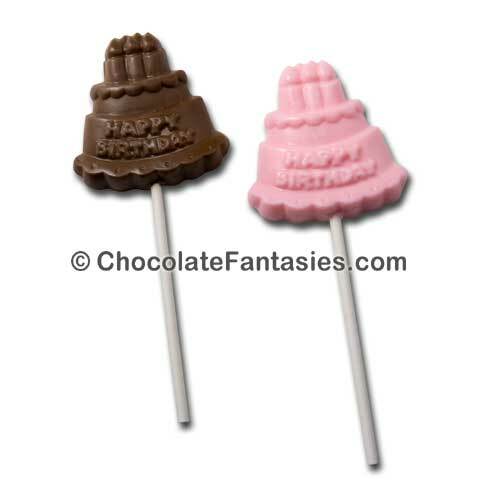 Happy Birthday Cake Lollipop - $2.75 ea. Three tiered cake that says, "Happy Birthday." 1 ounce, poly bag, tied with ribbon. Cupcake with Cherry Top Lollipop - $2.75 ea. Available in three color as shown with red cherry on top or one color. 1 ounce, poly bag, tied with ribbon. 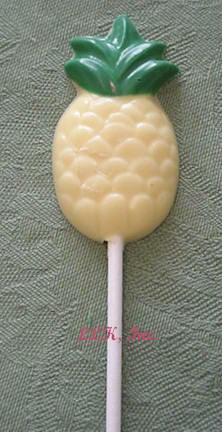 Chocolate Pineapple Lollipop - $2.75 ea. Available in one color or two color with green top. 1 ounces, poly bag, tied with ribbon. Pineapple flavor is available for .15 each extra with a minimum of 12 lollies. 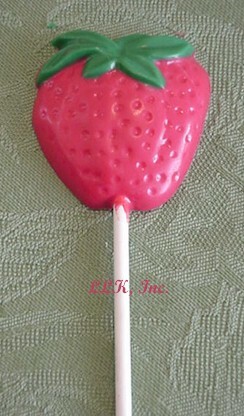 Chocolate Strawberry Lollipop - Starting at $2.75 ea. Available in one color or two color with green top. 1 ounces, poly bag, tied with ribbon. Strawberry flavor is available for .15 each extra with a minimum of 12 lollies. Approx. .5 oz. 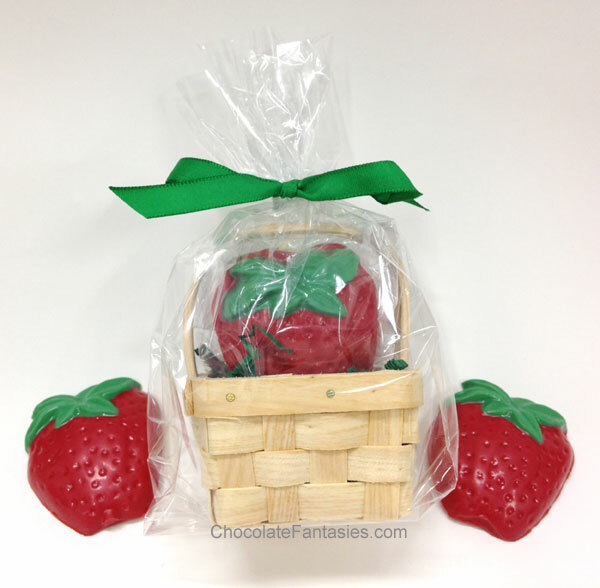 Four strawberries in a wood basket. Basket is filled with green sizzle pack and all wrapped in poly bag tied with ribbon. Available in one color or two color with green top. 1 ounces, poly bag, tied with ribbon. Strawberry flavor is available for .15 each extra with a minimum of 12 lollies, email us to add on. Approx. 2 oz. 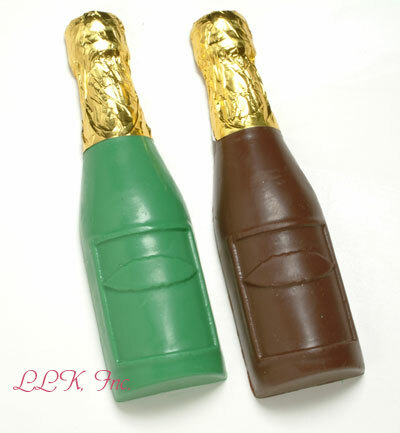 Chocolate Champagne Bottle - $7.99 ea. 5 ounces, solid, flat back, about the size of a split. Foil top, poly bag tied with ribbon. Email for full bottle (front and back) price. 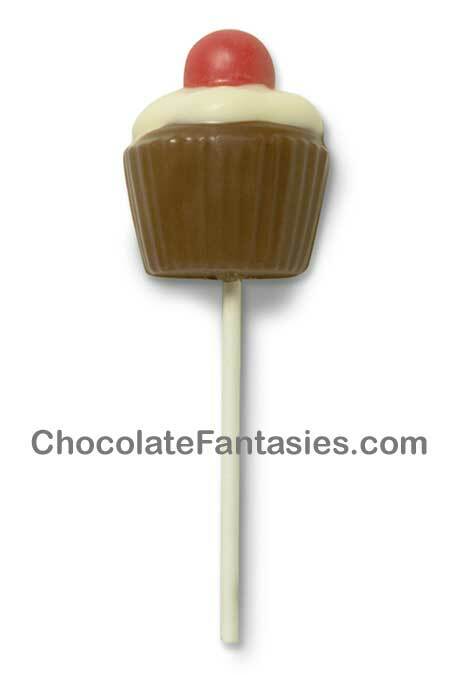 Champagne Party Lollipop - $3.00 ea. 1 ounce - poly bag tied with ribbon.